Find out which of your users' emails are exposed, before the cyber criminals do. 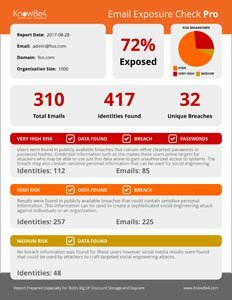 Many of the email addresses and identities of your organisation are exposed on the internet and easy to find for cyber criminals. With that email attack surface, they can launch social engineering, spear phishing and ransomware attacks on your organization. Does deep web searches to find any publicly available organisational data. This will show you what your organisational structure looks like to an attacker, which they can use to craft targeted spear phishing attacks.